Over the last couple of months, Yasiel Puig has emerged as the hottest player in the hobby. Collectors have been clamoring for whatever cards and memorabilia they can find of the phenom. 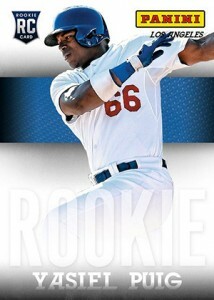 With more cards on the way in the weeks and months ahead, Panini has announced a limited autograph deal with Puig. Under the deal, Puig will sign memorabilia for the company's Panini Authentic line. The Dodgers outfielder will also appear at Panini's VIP event in conjunction with the 2013 National Sports Collectors Convention where he will sign autographs for attendees. A special Panini Authentic photo is being made just for the appearance. Just as the name suggest, Panini's VIP party is open to a small number of people. The first 75 people to register and spend at least $7,500 on Panini hobby products at the National are eligible. Last year's event included appearances by Gordie Howe and Ivan Rodriguez as well as lots of giveaways. The first Panini Authentic Yasiel Puig autographed memorabilia will be available in August on the company's website. For those unable to attend the Panini VIP party, the Dodgers are in town to play the Cubs on the same day.